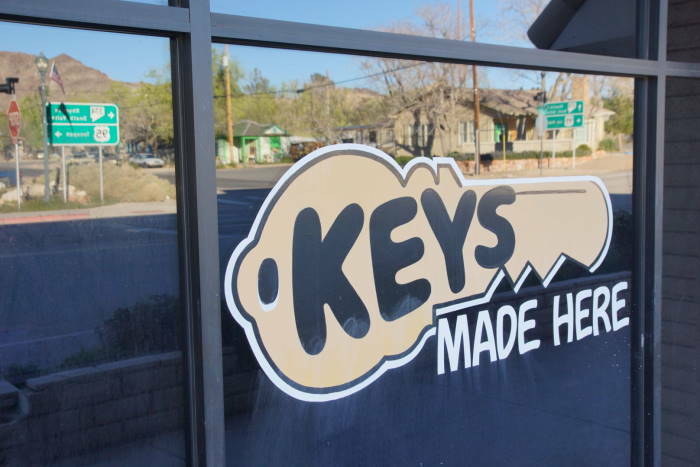 There isn’t a whole lot going on in Beatty, Nevada, but this little town is still great for at least one thing. 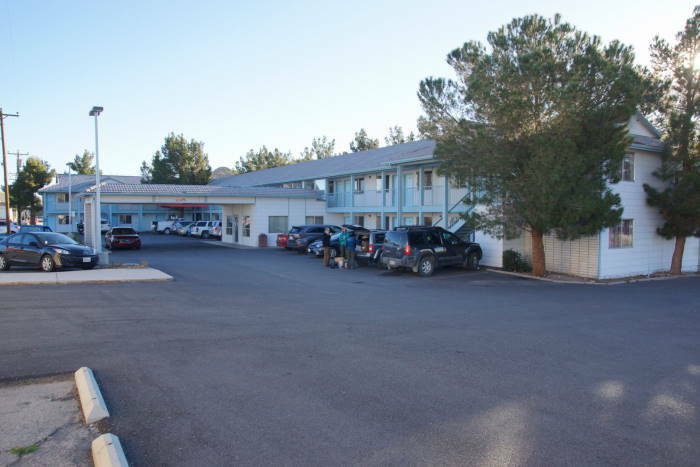 It has several low-cost (and low-frills) motels, which make it a perfect base of operations for your visit to Death Valley National Park. Here’s a look at what you’ll find, if you decide to stay for a day, or a week. 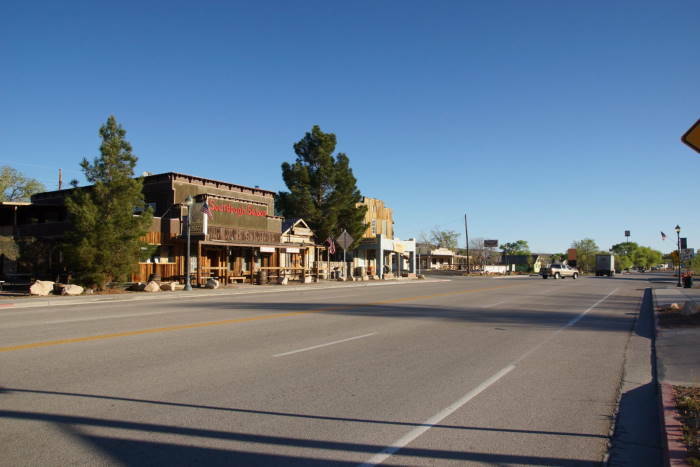 Beatty, Nevada is located along US 95, about 115 miles northwest of Las Vegas. It’s at the crossroads of Nevada Highway 374, which leads into Death Valley National Park. Beatty goes by in the blink of an eye. Okay, you’ll need to make it a really slow blink, because there’s a really slow speed limit that starts a long way from town, and there’s a 4-way stop in the middle of things. But still, it’s a tiny town — so small that it doesn’t even have a proper grocery store (as of my visit in 2016, although it looks like stores have come and gone over the years). This is a look at downtown Beatty, from right around the 4-way stop. 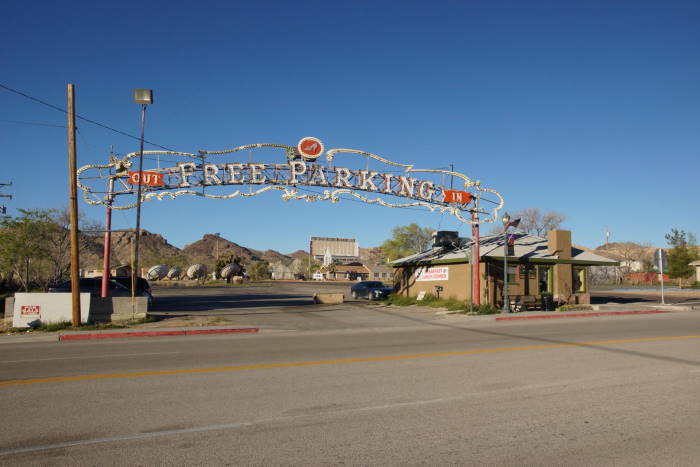 There are several motels, a couple of gas stations, and a handful of saloons and restaurants. It’s enough to keep you going for a few days, if you decide to make Beatty your base of operations for a Death Valley visit. I had an excellent meal at KC’s Outpost, which is one of the buildings in the photo above. They made an out-of-this-world turkey sandwich with real turkey — I’m talking about a real oven-roasted Thanksgiving style bird, sliced and put on a sandwich, along with stuffing that was really cooked inside the turkey. On the flip side, I had a nightmare of a meal at the Denny’s up the street. Service took about an hour, and I ended up taking my expensive sandwich to go, because rain water was dripping through the light fixtures and onto my table (but I wasn’t offered a different place to sit, or even an apology). 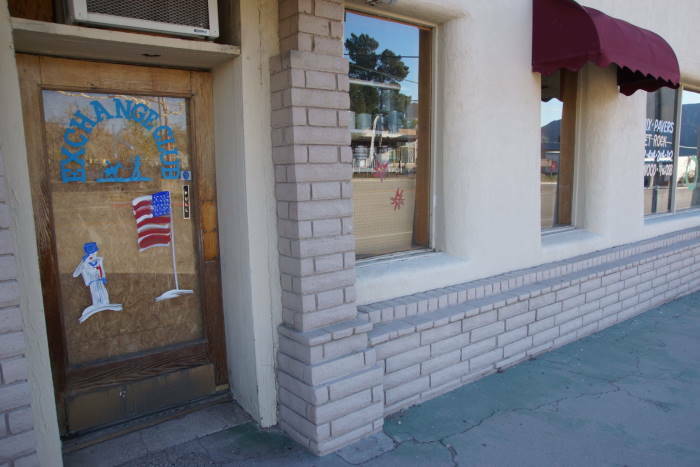 and it looks like a hardware store tried to do business out of the casino’s building for a while. The building is now boarded up, but a peek through the windows still revealed some hardware items on the shelves — along with a collapsing ceiling. The restaurant closed along with the casino (presumably after 100 years in business, if the date on the sign is correct). The offer of free parking across the street isn’t quite as tempting as it used to be. It’s still an impressive sign, though — even though it no longer brightens up the night. 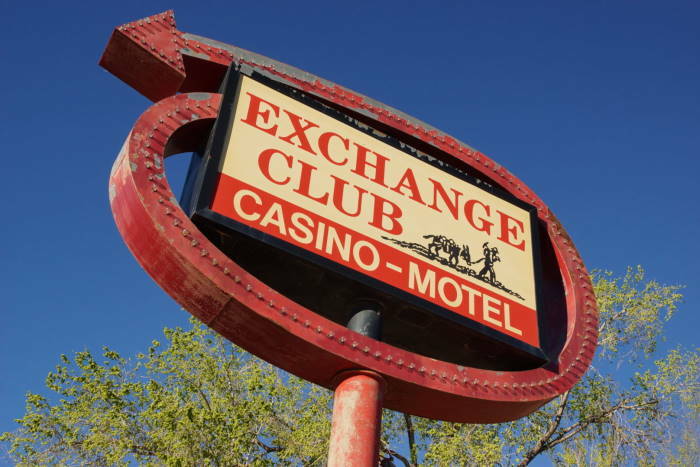 Back in 2005, and again in 2016, I stayed at the motel portion of the Exchange Club, which is still open for business. This is a very basic motel, and I can confirm that the rooms have not changed much in 11 years (although I did have a flat screen tv this time). As soon as I walked into the room, I said to myself, “Oh, yeah, this looks familiar.” While it’s very basic, it’s clean and reasonably comfortable. Just keep your expectations low and remember how cheap it is. At first I planned to stay here two nights, then I added another, and another. When I tried to add a fifth night, my room had already been booked, but the staff helped find a room for me at the Stagecoach, up the road. The Stagecoach has a casino that’s still in operation, along with a swimming pool, and that Denny’s that I mentioned earlier. While the room was slightly newer, the TV was older, and the bed was just as marginally comfortable as the one at the Exchange Club. Oh, and it was about $20 more expensive. If you don’t need a swimming pool, I’d suggest staying at the Exchange Club. From Beatty, you can be in the middle of Death Valley within a half-hour. That short drive can save you some serious cash, compared to staying at an accommodation inside the park. But, I do suggest you stock-up with the basics before arriving. Beatty doesn’t have its own Wal-mart, or even its own grocery store.